Janta Dal Secular's and Congress alliance CM pick HD Kumaraswamy finally took oath as Karnataka's twenty-fifth Chief Minister at Vidhan Soudha. Congress' G.Parameshwara takes oath as Deputy Chief Minister of Karnataka, administered by Governor Vajubhai Vala. The swear-in ceremony of JD(S)-Congress alliance CM pick Kumaraswamy have led opposition to unite against PM Narendra Modi-led BJP aiming 2019 Lok Sabha Election. Kumaraswamy's designated oath ceremony was attended by the galaxy of opposition leaders and Chief Ministers. From Arvind Kejriwal, Sonia Gandhi to Mamata Banerjee, Mayawati. The swear-in ceremony was a unite ceremony for the oppositions. HD Kumaraswamy, his brother HD Revanna, G.Parameshwara, Kerala CM Pinarayi Vijayan were also present at Vidhan Soudha for the oath ceremony. 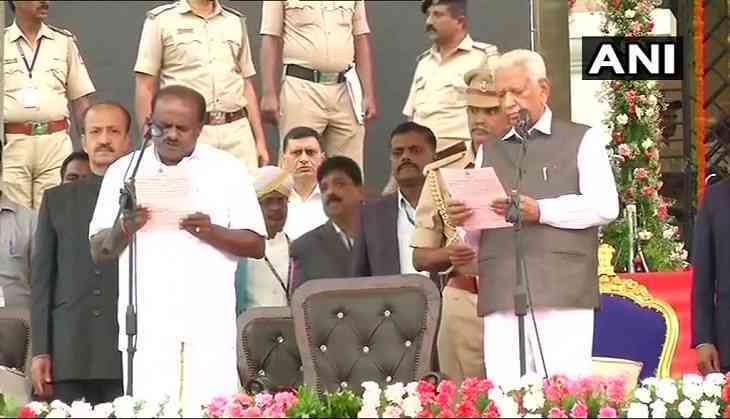 Well, Kumaraswamy is the second CM to take oath in 2018 assembly within a week after Yeddyurappa stepped down without facing floor test in May 2019. Congress General Secretary in Karnataka KC Venugopal said the party would get 22 portfolios of the 34-member cabinet, while 12 portfolios, including the chief minister's portfolio, would be given to the JD(S). The portfolio allocation will be decided after the floor test on 24 May. They will be sworn in after the floor test slated for Thursday. Karnataka's newly elected CM HD Kumaraswamy has invited Sonia Gandhi, Rahul Gandhi, Mayawati, Akhilesh Yadav, Arvind Kejriwal, Chandrababu Naidu, KCR, Mamata Banerjee, Farooq Abdullah, Sitaram Yechury, Pinarai Vijayan and Tejaswi Yadav for his oath-taking ceremony. Earlier in the year 2006, Kumaraswamy became CM for the first time with the support of BJP. Then his government lasted twenty months.